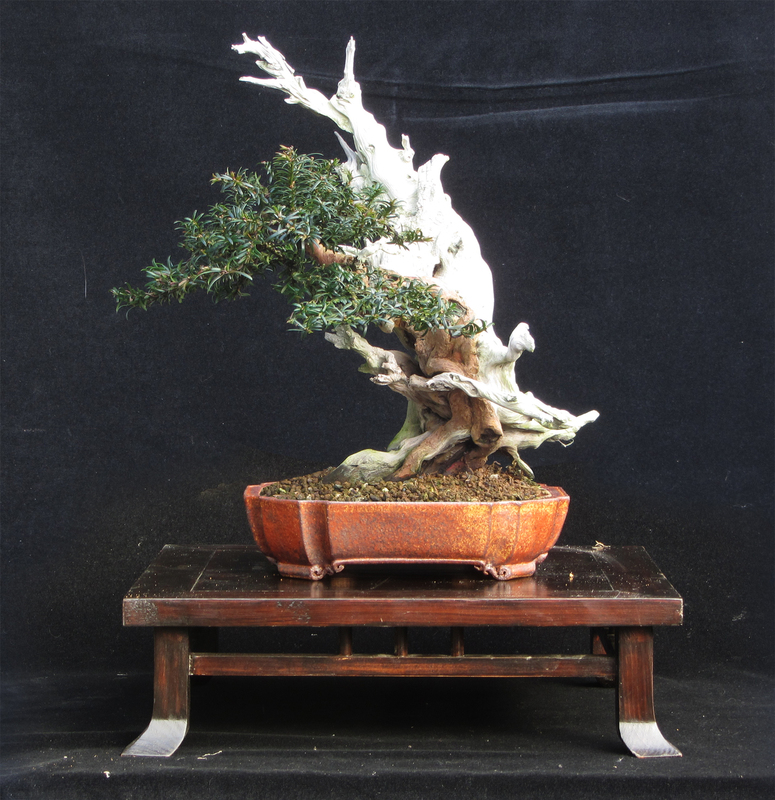 Radical bending on a Kifu Yew to place the character branch. 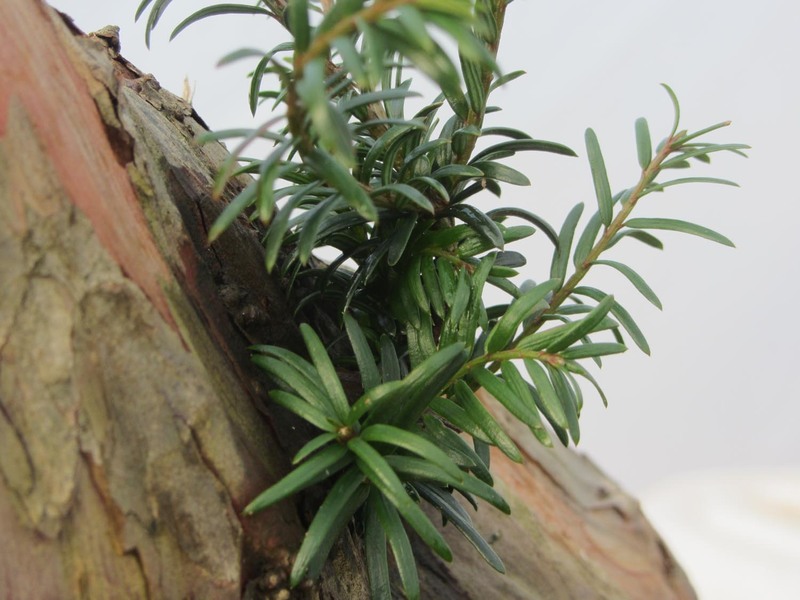 This lovely little Yew has been collected for 4 seasons and is ready to have some serious bending. I have waited until this seasons new growth has begun before I started the work. I wanted to use the thick branch with the extensive deadwood as a low character branch. 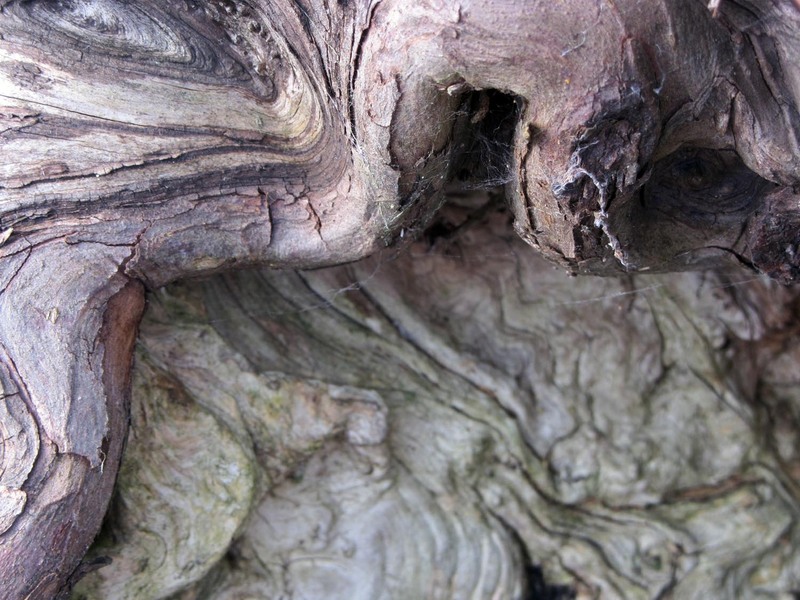 The live vein ran up the back of the branch, 75% is deadwood. I started with a fine saw cut all the way through to the live so that when I split the branch it did not go too far down. Using branch splitters and concave cutters I removed the deadwood as close to the live without compromising the health of the tree. I then drilled two holes into the sawn section, these would secure the thick copper wire that will support the branch and assist in the bend. The whole was then wrapped with wet raffia and secured with cable ties. The bend was done slowly with two hands ensuring a smooth curve with no ‘kinks’ in the live vein. The branch will now be left till the end of the season to recover and continue to grow. 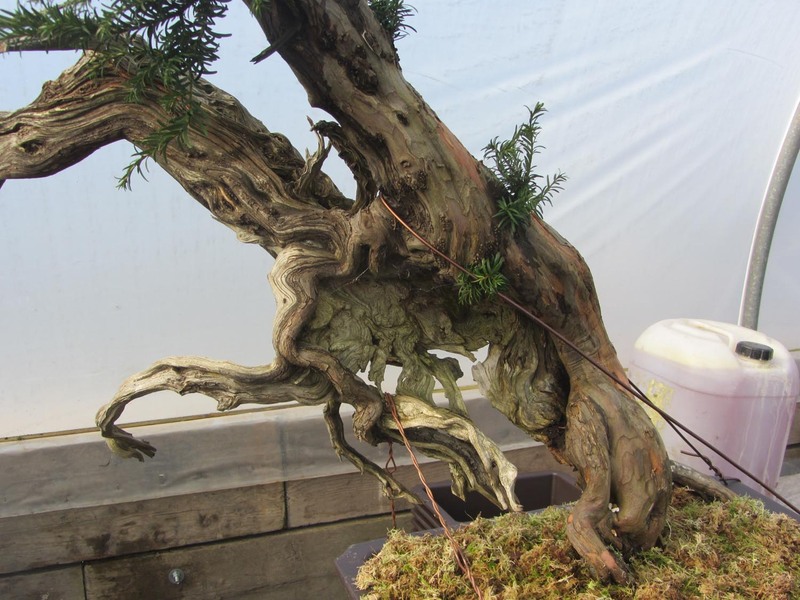 This is a very old Yew collected in 2010, it is a tree that I visited on the hill many times before the tree was collected, and one that I took students to as an example of a ‘real’ yamadori in the wild. 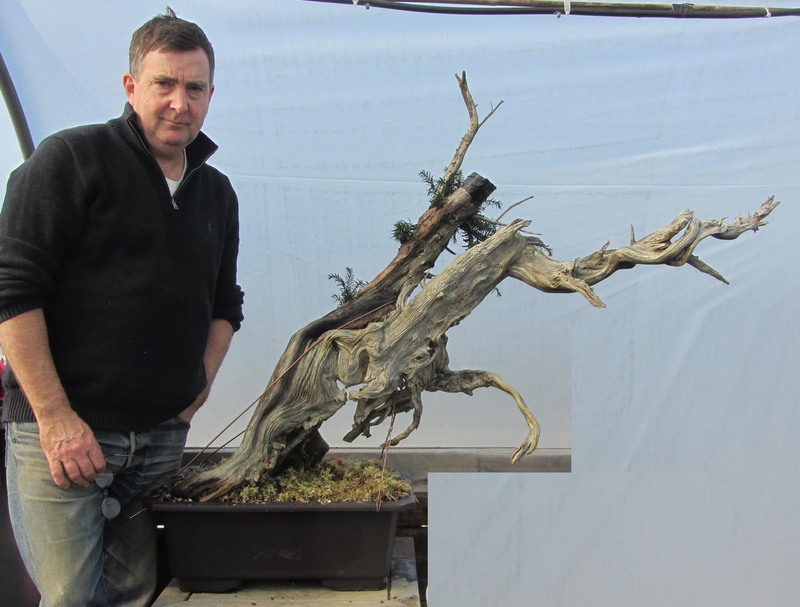 It was never my intention to collect this tree, as it was very long, it was growing directly in a rock crevice on a cliff face with no foliage close to the base of the tree. Whilst visiting the tree at the end of April 2010 I noticed that it had fallen from its lofty position and was being held in place by a very small section, the fierce weather that winter had dislodged the rock that was gripping the tree and the whole could at any time fall to the valley below. There was only one course of action, ‘Save the tree’ and this took place the next day. Four friends, two on ropes and one helping with passing tools etc. helped me. The tree came away in less than ten minutes as 95% of it was hanging in mid air… But with little root as most had snapped off in the winter storms, what you see in the photo are dead roots that have been exposed to the weather for many months, you can see where the large rocks have fallen away. After the second year I removed the top of the tree after encouraging new buds lower down the trunk, this was done by slicing the live vein 2cm above the buds to stop the flow of sap and force it to the weaker buds, this worked remarkably well and will callus over at a later date. The new grown lower down the trunk is now very strong. I have planted the tree in a much larger container to give free root growth to thicken branches and to place the tree closer to the final design I am after. The potting mix is 60% Pumice 20% Acadama and 20% Kiryu. In 2008 Sandro Segneri one of the invited artists at this years Noelanders Trophy was in my garden. Sandor was working at the Burrs workshop and was taking time out. 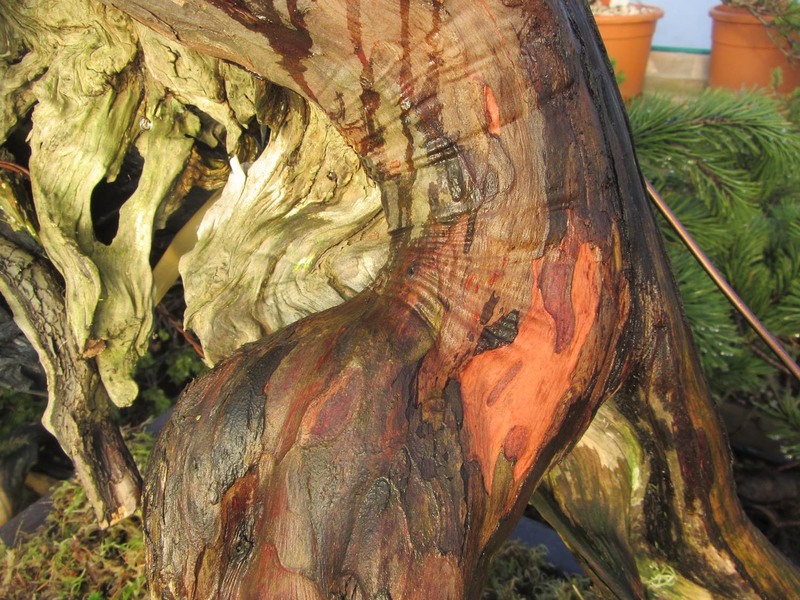 When he saw this Yew Sandro was drawn to the sweeping curves of the deadwood and likened the movement of the tree to calligraphy. 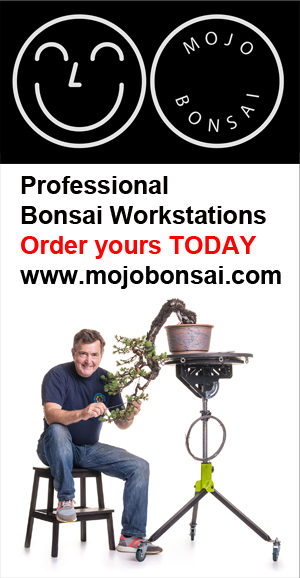 I find it pretentious in naming your own trees, however I liked the name Sandro gave to this bonsai. 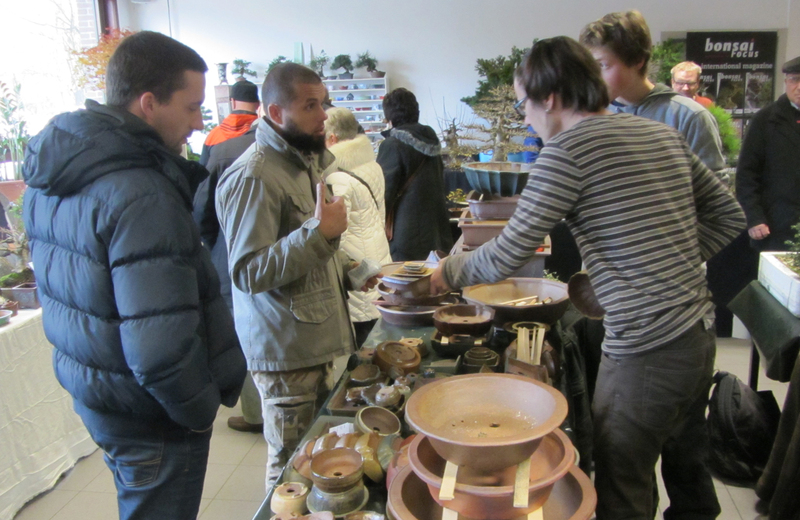 Finding the correct pot for this tree has not been an easy task, the tree has been potted in a number of different containers. Last year Erik Križovenský from Slovakia attended one of my workshops. He brought this unusual pot for me, it was not made especially but when I saw it I considered it to be an interesting match with this tree. The Space available to pot the root ball is quite small, planted 18 months prior to the Noelanders trophy this tree would need to be transferred to a larger pot soon after the event. In deciding how the tree would be presented I needed to consider the strange pot, the unusual style of the tree and its name. Terry Foster and I worked with a number of different tables and none really suited the tree. 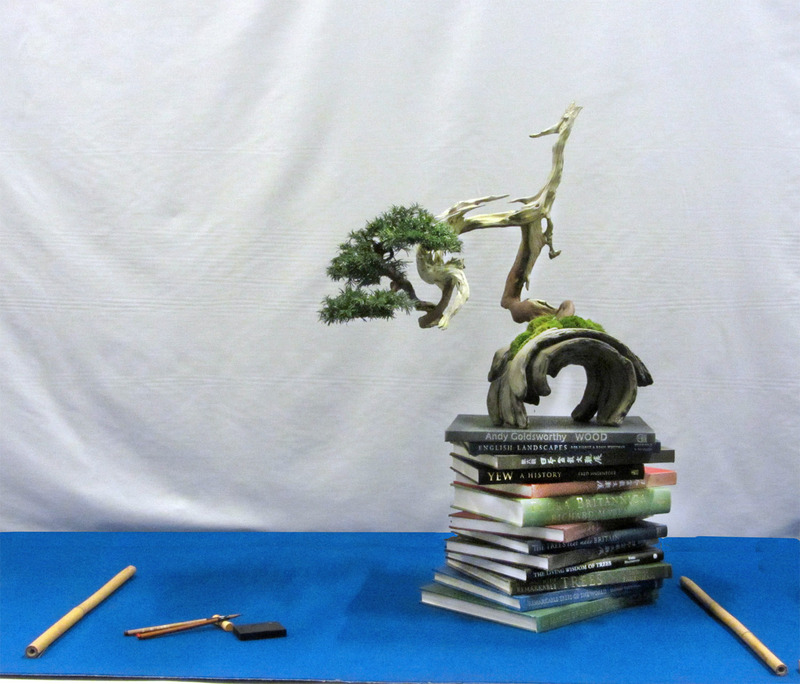 We decided to look for inspiration in the many bonsai exhibition books that I have. As we waded through the pile of books nothing presented itself as a suitable option. It was then that we noticed that pile of books and wondered if these in fact could be our table. The original idea was to wrap the books with white covers, this would make the publications anonymous however it simply did not work. In deciding to use the books ‘as is’ made my job easier and the choice of books is key to the idea. If you look carefully at the spine of each book they all form the background to the styling of the tree. Once this decision was made the choice of accompanying planting or supporting objects needed to be considered. An accent plant or something else, the choice of Calligraphic brushes and ink stone seemed the obvious choice. On presenting the tree for photography at the event I was very happy with the selection of books and the colours of the binding. The tree or should I say the display was received well with most liking what I present and making a point of telling me… and a few really not getting it! 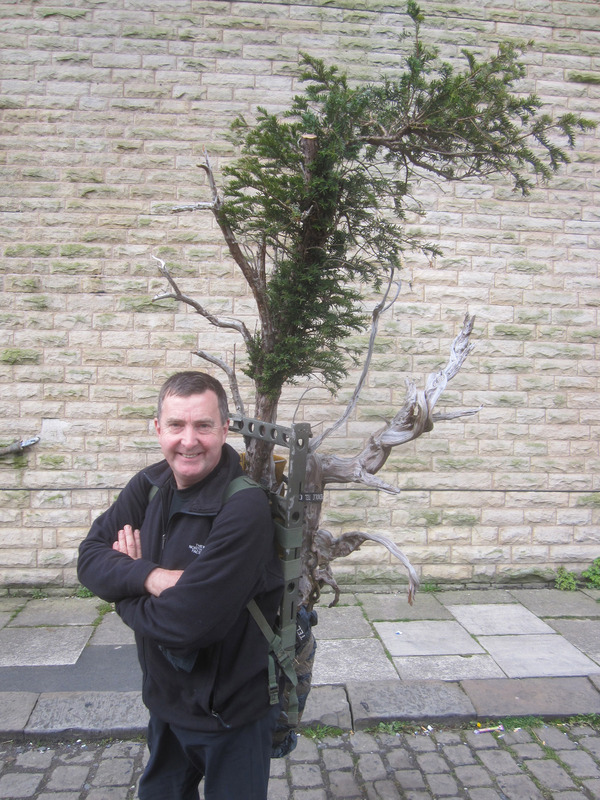 I ventured opinions from those I valued, Peter Warren was candid stating “the focus is on the books and not the tree, even though the tree is good” and I admit on reflection he is right! Everyone talked about the books… and no mention of the tree. When considering an unusual display the quality of the tree must be excellent and not play second fiddle and I fear this may have happened. However I was surprised that the display did not look out of place, and was somewhat disappointed that more folk did not rage against it. My old friend Bill Bailey did not mince his words “I don’t like it… but I AM a traditionalist” I also overheard this comment “if I wanted to see books I would have gone to a library” I take comfort in the words of Oscar Wilde “There is only one thing in life worse than being talked about, and that is not being talked about.” And nobody talked about the ‘other’ tree I had in the show so I guess there IS merit in what I did.